Hello again, its nice to have some time to write a store article again finally. 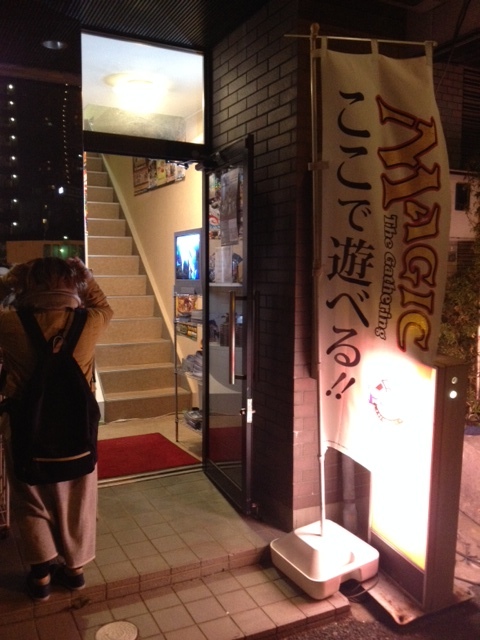 I’ve been sitting on these pictures and reviews for quite sometime, so today I will be talking about 2 more Magic the Gathering stores I visited the last time I was in Hamamatsu, Shizuoka prefecture. If the name sounds familiar, it’s probably because Nagoya also has a store by the same name. I’m guessing it’s not a huge chain store just yet (as I haven’t seen it outside of the Tokai area), but at least I can say it is a regional one. I’ve been impressed with both TCG 193 stores and have become somewhat of a fan. They are set up well and support various card games. Magic the Gathering isn’t their main product as you can see, but nonetheless you can find some good deals there. Their single card selection isn’t bad for a store that doesn’t focus solely on MTG. I found that about 70% of their cards are from older formats, such as Modern, Legacy, and even EDH. I’ve been very surprised by their prices. They are very competitive, and probably have the best prices in Hamamatsu. I was able to get modern and standard staples at this store over the past few months for 20% less than what I would have paid in a larger city like Nagoya. While you won’t be able to pick up large amount of cards here, you can still save a large chunk of cash and pick up some cards to trade/sell later for a profit. An example would be picking up Mox Opal for 4000 yen a few months back while the stores in Nagoya had it at 6000. The most obvious reason behind these great prices are that there are less Magic players in Hamamatsu than in Nagoya. There are a lot standard players, and the modern player base has been growing, but everything else tends to be open season. If you ever have the chance to stop in Hamamatsu for a few hours, it’s definitely worth the time to look through their singles. 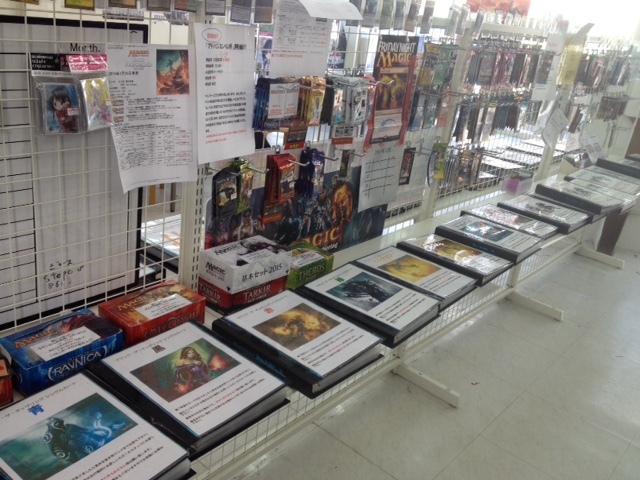 You can also ask to see foils and other cards not on the shelf if your Japanese is good enough. It depends on who is working, but I convinced the staff to let me take a look and spent a good half hour seeing what they had before making some purchases. 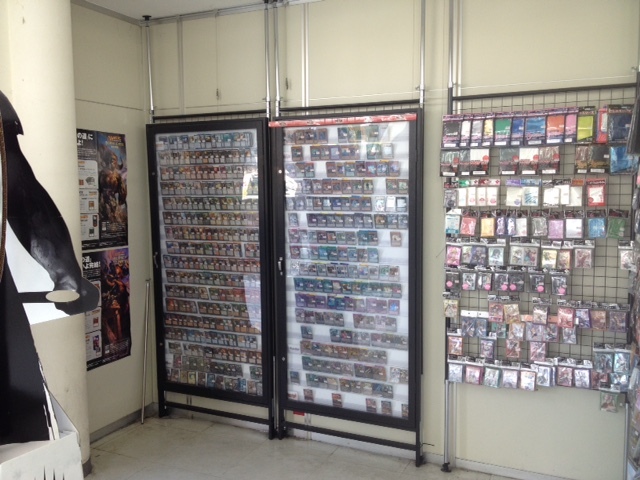 TCG 193 in Hamamatsu has both modern and standard tournaments at their store. The playing space can accommodate a decent amount of players (24 plus), and turn out is alright. Standard is definitely more popular than Modern in Hamamatsu, but you should still be able to play a few tournaments a month between here and other stores. Just be sure to check the schedule. 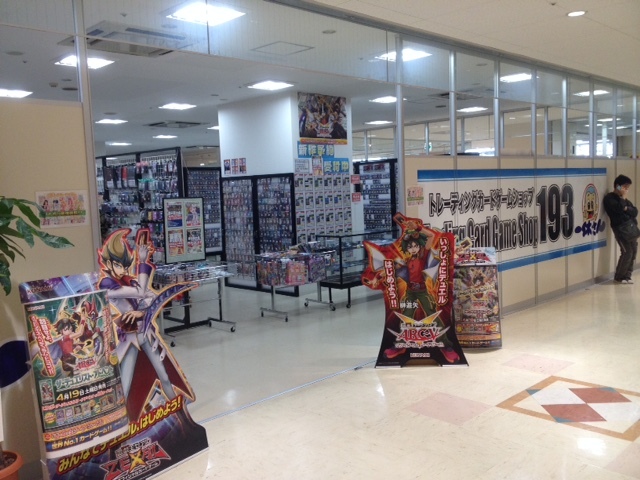 Getting to TCG Shop 193 can be a little difficult for somebody not accustomed to Hamamatsu, but coming from somebody that lived in the city for 4 years, I can tell you that it’s not that big of a city and you won’t spend that much time lost. I’ll start off with the link to the store’s directions on their webpage in Japanese, then give you the directions in English. From Hamamatsu station, you’re going to head out of the May One shopping exit and take a left. From here, walk past the Entetsu Department store buildings (between them) and keep going until you reach the crosswalk with a Starbucks across the street. From here, the most straight forward route is to take the sidewalk to the right and walk past Starbucks. You’ll see a parking lot on your left side and once you get to the road after the parking left, turn left. From here it’s a straight shot to the Zaza City shopping center. There are 2 Zaza buildings, but you’ll want to walk past the first one and enter the one with Toho Cinemas in it (there is also another Starbucks in this building). Go down to the basement and you should see a super market and cafe. On the same floor you should find TCG 193. If you get lost or can’t find it, call the number given on their website. It’s not a place I would probably play FNM, but if I was living in the Hamamatsu area or visiting it, I would definitely stop by. Prices in Tokyo and Osaka are extremely expensive, but in these smaller areas where MTG is less popular you can get some really good deals. The community in the city is a lot more casual than other places, thus the demand for cards is a lot lower. I really liked the previous Master’s Guild up near Kamijima station off the Akiha highway. It had 2 floors, lots of play space, board games, and easy to look through folders with card prices in them. Sadly, the rent was raised and it was too high for the owner to continue using that location, so they opened a newer store closer to downtown that is much, much smaller. One thing they do have going for them is the location. It’s located right next to a train station which makes it very easy to get to if you’re from out of town. It’s also located downtown. This is a double edged sword though. Most of the previous players at the old location would drive and park in order to play. The new store has no free parking, and while parking in Hamamatsu overall isn’t that expensive, it’s still a draw back. You can still find a lot of accessories here such as playmats, sleeves, and cases, but as you can see the store seems to cater more towards other card games now. 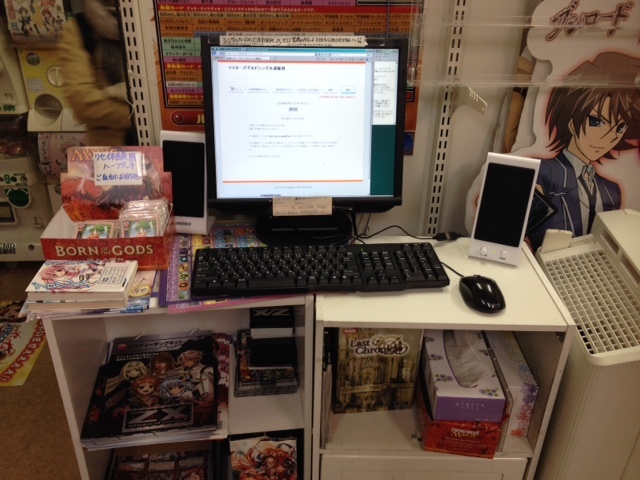 The previous store had counter by the cash register that was full of MTG cards. You’ll still be able to get the booster packs you need, but it just has to share more floor space with others now. The store still holds pre-release events, Friday Night Magic, and other weekly events here, but in a much smaller number. I have been to a FNM here once or twice in 2014, and only 4 people showed up. I ended up hopping on the train and going to their 8pm FNM at their Hamakita store instead where a healthy 14 playesr showed up. They have a 4pm and 8pm FNM every week, with the earlier one being Modern. (UPDATE: The picture above is old now. 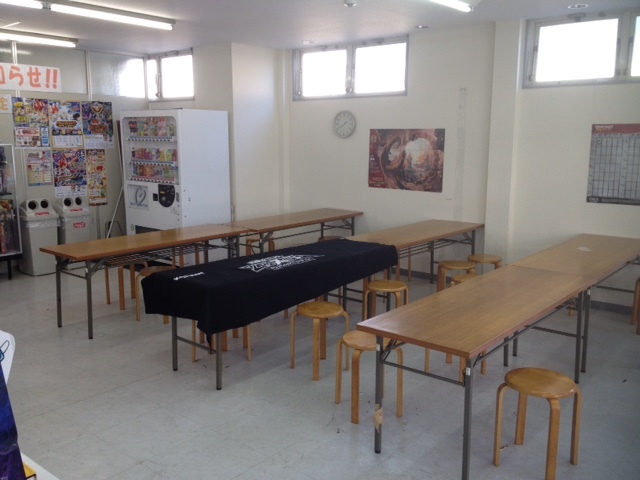 On recent visit, I saw that the store had added another table to up the capacity to about 30 people in their store. It’s not bad. There are also card cases and the walls have been decorated). As I said above, space is limited at this new store so it simply isn’t possible to have binders with cards everywhere or cards in cases. The owner puts cards in a case by the door often, but it only amounts to about 40 cards in total. Luckily, you don’t have to waste all of your time traveling out there and looking through their system if you don’t want to. You can use their website to check their inventory ahead of time, and if its available you can head into the store or order it online (if your Japanese is that good). I recently spent a few hours going through their inventory online and found that they had quite a few good deals on cards. Some were half the price of what you’d pay in the USA, and others were a 3rd. If you have the time to look through them, you’ll probably find some good deals. The easiest way to search is to just type the name of a card in English in the top right search box and press enter. It’s painstaking, but worthwhile. While I am disappointed overall in the store compared to the previous one, I find it to be a great resource. I must say that the staff there is very helpful and very kind. I always enjoyed talking with the owner when I’m there about MTG in town and he went out of his way to help me with the computer system when I was there. I’m not sure about picking up foils there, but if you ask they might have some you can look through. I’ve never tried to sell cards there either, but looking at their prices I would think they’d give you more in value than other places since they tend to focus more on MTG cards. Pretty easy to find. Like I said, it’s right next to a train station. From JR Hamamatsu Station, go out the May One shopping area exit and take a left again, just like you’d do for the other stores. This time go between the Entetsu Department stores and right after you pass them you’ll see SHIN HAMAMATSU station on your left side. This is the Entetsu Line. Buy a ticket for Enshu Byoin Mae and get on the train. It’s 3 stops away from Shin Hamamatsu and walkable, but if you don’t know the area I’d recommend just taking the train. At Enshubyoin Mae station, go down the stairs to the street level and take a right. You’ll see a Police Box (Koban) on your right side, and just past that only about 50 feet you’ll see a small red light up sign for Master’s Guild and stairs leading up into the store. If you can’t find it for some reason, just ask the police at the Police Box! I want to like it, but I just can’t when their Hamakita store is the obvious spiritual successor to the original one. 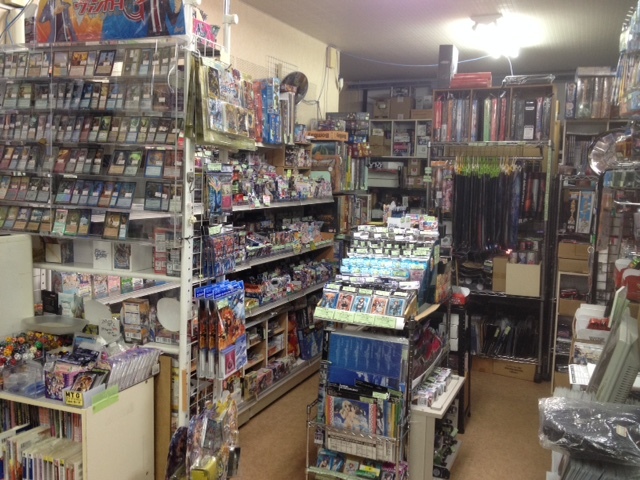 If you want to browse singles, look through binders, and play in bigger tournaments, spend about 300 yen to visit their store on the Entetsu Line near Hamakita station. Their prices are mostly higher than the other stores in the area, but you can find great deals sometimes. The drawback is that you have to look through their online inventory system which can be difficult for non-Japanese speakers and counter-intuitive. On the plus side, they do still sell some board games, and without any other stores in the area that do, this will be your go to place for Dungeons and Dragons and the like. 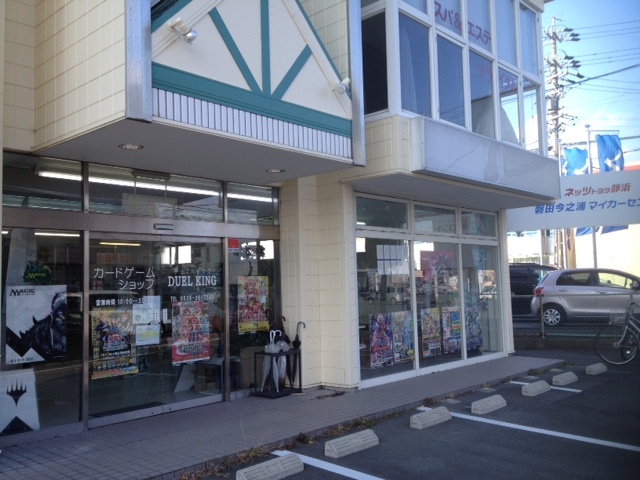 As a bonus on today’s article, I’ll be introducing a little store in my wife’s hometown next to Hamamatsu that I was able to check out the last time I was there. The store has been open for 2 years, but it only recently showed up on Wizards of the Coasts’ Locator. I’m guessing they recently made the jump over to Magic the Gathering, and it took them some time to “level up” the store in order to host events and what not. For the most part the store is focused on MTG, but they also have a decent amount of Yugioh cards as well. 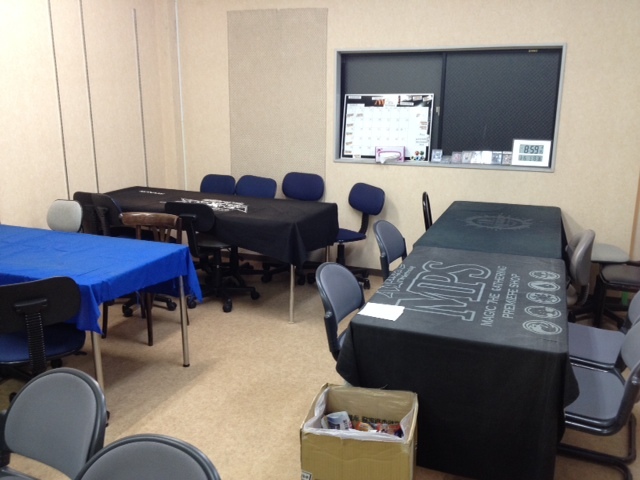 They host FNM and have Saturday tournaments every week, and sometimes hold events on Tuesdays. They hold pre-releases when new sets come out, and there is a schedule inside the store that you can check out too. The store is rather basic, or should I say bare bones. Aside from the small singles case, they have the rest of their singles in these binders that you can look through. I thought the prices were average, or at least on par with what you’d see at a place like Amenity Dream. It’s definitely cheaper than Master’s Guild is in Hamamatsu the next town over. Their buy prices are also nothing to write home about. Duel King’s selection isn’t that big just yet, so it won’t take you too long to look through what they have. I believe you can check out what they have on their website, though I’m not sure how much they update it. Rent is a lot cheaper outside of major cities, which means that there is a lot of space to play games at Duel King. While the chairs don’t look too inviting (nor the tables), it can easily 24 people plus. The store is also well lit in both the day time and at night, and their tournaments are dirt cheap to play (100 yen I believe). The store is nowhere near the station. I’d say it’s a 20-30 minute walk, but by car and bus probably closer to 10 minutes (depending on traffic). I don’t know the street names around Iwata at all, so your best bet would be to just follow the directions via the map on their Yahoo Yellow Page. They also have their phone number on there as well so you can call if you get lost. I can only say that it’s on highway 43 and on your left, across the street from a Shizuoka bank before the stop light. There was some parking I think, but not a lot. I don’t think that will be a big problem for you though. If you’re living in the area and don’t want to travel all the way out to Hamamatsu for a game, make your way over to Duel King. It’s also a great place to host tournaments if you have friends visiting. I’m sure the staff there would be more than happy to sanction an event for you if you can get 8 people to show up for a tournament. The biggest drawback of the shop is the location. Without a car it can be a little hard to get to, and even if you do make it out there it might not be worth your time. I always visit my family back in Iwata, so I’m perfectly fine popping in for a few minutes while I’m there to see what new stuff they got. It’s been a while since I’ve been there, so it might have changed since then! I hope you enjoyed this little adventure into Magic the Gathering shops in Japan. I believe this wraps up the Hamamatsu area in western Shizuoka, but if the game continues to grow who knows! Two years ago there was really only 1 MTG store to go to. 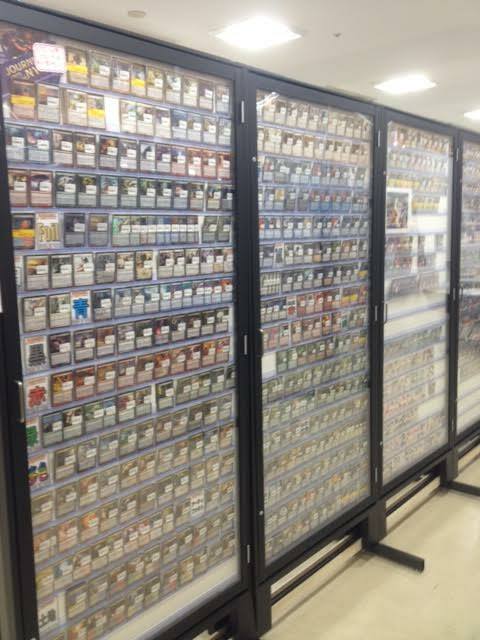 I had quite the trip to Osaka a few weeks ago and visited the TCG mecca near Den Den town. I am looking forward to talking all about it, but it will have to wait. I have quite a few more articles planned over the next few weeks and won’t have the time. This weekend is Fate Reforged Game Day so you can be sure I’ll have an update on the metagame here in Japan, as well as some updates to my deck. Be sure to check back after the weekend! Thanks for reading. I’ll try to do more in the future when I have time! It’s great when I go to GPs cause it gives me a chance to check out stores that I usually don’t have a chance to. It really gives you a window into what MTG is like in other countries!